The time-dependent rate I(t) of origin firing per length of unreplicated DNA presents a universal bell shape in eukaryotes that has been interpreted as the result of a complex time-evolving interaction between origins and limiting firing factors. Here, we show that a normal diffusion of replication fork components towards localized potential replication origins (p-oris) can more simply account for the I(t) universal bell shape, as a consequence of a competition between the origin firing time and the time needed to replicate DNA separating two neighboring p-oris. We predict the I(t) maximal value to be the product of the replication fork speed with the squared p-ori density. We show that this relation is robustly observed in simulations and in experimental data for several eukaryotes. Our work underlines that fork-component recycling and potential origins localization are sufficient spatial ingredients to explain the universality of DNA replication kinetics. Before a cell can divide, it must duplicate its DNA. In eukaryotes – organisms such as animals and fungi, which store their DNA in the cell’s nucleus – DNA replication starts at specific sites in the genome called replication origins. At each origin sits a protein complex that will activate when it randomly captures an activating protein that diffuses within the nucleus. Once a replication origin activates or “fires”, the complex then splits into two new complexes that move away from each other as they duplicate the DNA. If an active complex collides with an inactive one at another origin, the latter is inactivated – a phenomenon known as origin passivation. When two active complexes meet, they release the activating proteins, which diffuse away and eventually activate other origins in unreplicated DNA. The number of origins that activate each minute divided by the length of unreplicated DNA is referred to as the “rate of origin firing”. In all eukaryotes, this rate – also known as I(t) – follows the same pattern. First, it increases until more than half of the DNA is duplicated. Then it decreases until everything is duplicated. This means that, if plotted out, the graph of origin firing rate would always be a bell-shaped curve, even for organisms with genomes of different sizes that have different numbers of origins. The reason for this universal shape remained unclear. Scientists had tried to create numerical simulations that model the rate of origin firing. However, for these simulations to reproduce the bell-shape curve, a number of untested assumptions had to be made about how DNA replication takes place. In addition, these models ignored the fact that it takes time to replicate the DNA between origins. To take this time into account, Arbona et al. instead decided to model the replication origins as discrete and distinct entities. This way of building the mathematical model succeeded in reproducing the universal bell curve shape without additional assumptions. With this simulation, the balance between origin activation and passivation is enough to achieve the observed pattern. The new model also predicts that the maximum rate of origin firing is determined by the speed of DNA replication and the density of origins in the genome. Arbona et al. verified this prediction in yeast, fly, frog and human cells – organisms with different sized genomes that take between 20 minutes and 8 hours to replicate their DNA. Lastly, the prediction also held true in yeast treated with hydroxyurea, an anticancer drug that slows DNA replication. A better understanding of DNA replication can help scientists to understand how this process is perturbed in cancers and how drugs that target DNA replication can treat these diseases. Future work will explore how the 3D organization of the genome affects the diffusion of activating proteins within the cell nucleus. Eukaryotic DNA replication is a stochastic process (Hyrien et al., 2013; Hawkins et al., 2013; Hyrien, 2016b). Prior to entering the S(ynthesis)-phase of the cell cycle, a number of DNA loci called potential origins (p-oris) are licensed for DNA replication initiation (Machida et al., 2005; Hyrien et al., 2013; Hawkins et al., 2013). During S-phase, in response to the presence of origin firing factors, pairs of replication forks performing bi-directional DNA synthesis will start from a subset of the p-oris, the active replication origins for that cell cycle (Machida et al., 2005; Hyrien et al., 2013; Hawkins et al., 2013). Note that the inactivation of p-oris by the passing of a replication fork called origin passivation, forbids origin firing in already replicated regions (de Moura et al., 2010; Hyrien and Goldar, 2010; Yang et al., 2010). The time-dependent rate of origin firing per length of unreplicated DNA, I(t), is a fundamental parameter of DNA replication kinetics. I(t) curves present a universal bell shape in eukaryotes (Goldar et al., 2009), increasing toward a maximum after mid-S-phase and decreasing to zero at the end of S-phase. An increasing I(t) results in a tight dispersion of replication ending times, which provides a solution to the random completion problem (Hyrien et al., 2003; Bechhoefer and Marshall, 2007; Yang and Bechhoefer, 2008). Models of replication in Xenopus embryo (Goldar et al., 2008; Gauthier and Bechhoefer, 2009) proposed that the initial I(t) increase reflects the progressive import during S-phase of a limiting origin firing factor and its recycling after release upon forks merge. The I(t) increase was also reproduced in a simulation of human genome replication timing that used a constant number of firing factors having an increasing reactivity through S-phase (Gindin et al., 2014). In these three models, an additional mechanism was required to explain the final I(t) decrease by either a subdiffusive motion of the firing factor (Gauthier and Bechhoefer, 2009), a dependency of firing factors’ affinity for p-oris on replication fork density (Goldar et al., 2008), or an inhomogeneous firing probability profile (Gindin et al., 2014). Here, we show that when taking into account that p-oris are distributed at a finite number of localized sites then it is possible to reproduce the universal bell shape of the I(t) curves without any additional hypotheses than recycling of fork components. I(t) increases following an increase of fork mergers, each merger releasing a firing factor that was trapped on DNA. Then I(t) decreases due to a competition between the time tc to fire an origin and the time tr to replicate DNA separating two neighboring p-ori. We will show that when tc becomes smaller than tr, p-ori density over unreplicated DNA decreases, and so does I(t). 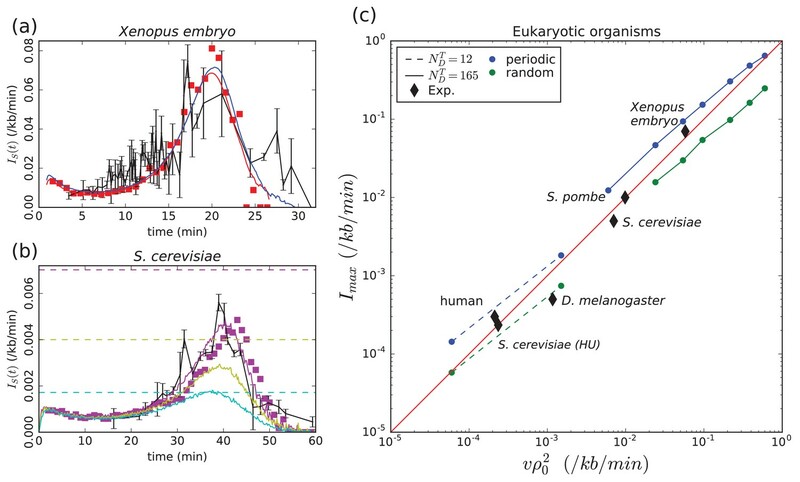 Modeling random localization of active origins in Xenopus embryo by assuming that every site is a (weak) p-ori, previous work implicitly assumed tr to be close to zero (Goldar et al., 2008; Gauthier and Bechhoefer, 2009) forbidding the observation of a decreasing I(t). Licensing of a limited number of sites as p-ori thus appears to be a critical property contributing to the observed canceling of I(t) at the end of S-phase in all studied eukaryotes. where Nfired(t,t+dt) is the number of p-oris fired between times t and t+dt, and LunrepDNA(t) is the length of unreplicated DNA a time t. Then we propagate the forks along the chromosome with a constant speed v, and if two forks meet, the two half firing complexes are released and rapidly reform an active firing factor. Finally, we simulate the chromosomes as 1D chains where prior to entering S-phase, the p-oris are precisely localized. For Xenopus embryo, the p-ori positions are randomly sampled, so that each simulated S-phase corresponds to a different positioning of the p-oris. We compare results obtained with periodic or uniform p-ori distributions (Materials and methods). For S. cerevisiae, the p-ori positions, identical for each simulation, are taken from the OriDB database (Siow et al., 2012). As previously simulated in human (Löb et al., 2016), we model the entry in S-phase using an exponentially relaxed loading of the firing factors with a time scale shorter than the S-phase duration Tphase (3 min for Xenopus embryo, where Tphase∼30 min, and 10 min for S. cerevisiae, where Tphase∼60 mins). After the short loading time, the total number of firing factors NDT is constant. As shown in Figure 1b (see also Figure 2), the universal bell shape of the I(t) curves (Goldar et al., 2009) spontaneously emerges from our model when going from weak to strong interaction, and decreasing the number of firing factors below the number of p-oris. The details of the firing factor loading dynamics do not affect the emergence of a bell shaped I(t), even though it can modulate its precise shape, especially early in S-phase. Emergence of a bell-shaped I(t). (a) Sketch of the different steps of our modeling of replication initiation and propagation. (b) IS(t) (Equation 1) obtained from numerical simulations (Materials and methods) of one chromosome of length 3000 kb, with a fork speed v=0.6 kb/min. The firing factors are loaded with a characteristic time of 3 min. From blue to green to red the interaction is increased and the number of firing factors is decreased: blue (kon=5×10−5 min−1, NDT=1000, ρ0=0.3 kb−1), green (kon=6×10−4 min−1, NDT=250, ρ0=0.5 kb−1), red (kon=6×10−3 min−1, NDT=165, ρ0=0.28 kb−1). (c) Corresponding normalized densities of p-oris (solid lines), and corresponding normalized numbers of free diffusing firing factors (dashed line): blue (NFD∗=3360), green (NFD∗=280), red (NFD∗=28); the horizontal dotted-dashed line corresponds to the critical threshold value NFD(t)=NFD∗. (d) Corresponding number of passivated origins over the number of activated origins (solid lines). Corresponding probability distribution functions (PDF) of replication time (dashed lines). Model validation by experimental data. (a) Xenopus embryo: Simulated IS(t) (Equation (1), Materials and methods) for a chromosome of length L=3000 kb and a uniform distribution of p-oris (blue: v=0.6 kb/min, kon=3.×10−3 min−1, NDT=187, ρ0=0.70 kb−1) or a periodic distribution of p-oris (red: v=0.6 kb/min, kon=6×10−3 min−1, NDT=165, ρ0=0.28 kb−1); (red squares) 3D simulations with the same parameter values as for periodic p-ori distribution; (black) experimental I(t): raw data obtained from Goldar et al. (2009) were binned in groups of 4 data points; the mean value and standard error of the mean of each bin were represented. (b) S. cerevisiae: Simulated IS(t) (Materials and methods) for the 16 chromosomes with the following parameter values: v=1.5 kb/min, NDT=143, kon=3.6×10−3 min-1, when considering only Confirmed origins (light blue), Confirmed and Likely origins (yellow) and Confirmed, Likely and Dubious origins (purple); the horizontal dashed lines mark the corresponding predictions for Imax (Equation 5); (purple squares) 3D simulations with the same parameter values considering Confirmed, Likely and Dubious origins; (black) experimental I(t) from Goldar et al. (2009). (c) Eukaryotic organisms: Imax as a function of vρ02; (squares and bullets) simulations performed for regularly spaced origins (blue) and uniformly distributed origins (green) (Materials and methods) with two sets of parameter values: L=3000 kb, v=0.6 kb/min, kon=1.2×10−2 min−1 and NDT=12 (dashed line) or 165 (solid line); (black diamonds) experimental data points for Xenopus embryo, S. cerevisiae, S. cerevisae grown in Hydroxyurea (HU), S. pombe, D. melanogaster, human (see text and Table 1). The following figure supplement is available for Figure 2. Thus, at the beginning of the S-phase, NFD(t) is small, ρp−ori(t) is constant (Figure 1 (c), solid curves) and so IS(t) stays small. When NFD(t) starts increasing, as long as Equation (4) stays valid, IS(t) keeps increasing. When NFD(t) becomes too large and exceeds NFD∗, then Equation (4) is violated and the number of p-oris decreases at a higher rate than the length of unreplicated DNA, and ρp−ori(t) decreases and goes to zero (Figure 1 (c), red solid curve). As NFD(t) tends to NDT, IS(t) goes to zero, and its global behavior is a bell shape (Figure 1 (b), red). Let us note that if we decrease the interaction strength (kon), then the critical NFD∗ will increase beyond NDT (Figure 1 (c), dashed blue and green curves). IS(t) then monotonously increase to reach a plateau (Figure 1 (b), green), or if we decrease further kon, IS(t) present a very slow increasing behavior during the S-phase (Figure 1 (b), blue). Now if we come back to strong interactions and increase the number of firing factors, almost all the p-oris are fired immediately and IS(t) drops to zero after firing the last p-ori. where we have used the approximation d(t)≈d(0)=1/ρ0 (which is exact for periodically distributed p-oris). Imax can thus be predicted from two measurable parameters, providing a direct test of the model. Given the huge size of Xenopus embryo chromosomes, to make the simulations more easily tractable, we rescaled the size L of the chromosomes, kon and NDT to keep the duration of S-phase Tphase≈L/2vNDT and I(t) (Equation (2)) unchanged (L→αL, NDT→αNDT, kon→kon/α). In Figure 2 (a) are reported the results of our simulations for a chromosome length L=3000 kb. We see that a good agreement is obtained with experimental data (Goldar et al., 2009) when using either a uniform distribution of p-oris with a density ρ0=0.70 kb−1 and a number of firing factors NDT=187, or a periodic distribution with ρ0=0.28 kb−1 and NDT=165. A higher density of p-oris was needed for uniformly distributed p-oris where d(t) (slightly) increases with time, than for periodically distributed p-oris where d(t) fluctuates around a constant value 1/ρ0. The uniform distribution, which is the most natural to simulate Xenopus embryo replication, gives a density of activated origins of 0.17 kb−1 in good agreement with DNA combing data analysis (Herrick et al., 2002) but twice lower than estimated from real time replication imaging of surface-immobilized DNA in a soluble Xenopus egg extract system (Loveland et al., 2012). Note that in the latter work, origin licensing was performed in condition of incomplete chromatinization and replication initiation was obtained using a nucleoplasmic extract system with strong initiation activity, which may explain the higher density of activated origins observed in this work. To test the robustness of our minimal model with respect to the distribution of p-oris, we simulated the replication in S. cerevisiae, whose p-oris are known to be well positioned as reported in OriDB (Siow et al., 2012). 829 p-oris were experimentally identified and classified into three categories: Confirmed origins (410), Likely origins (216), and Dubious origins (203). When comparing the results obtained with our model to the experimental I(t) data (Goldar et al., 2009) (Figure 2 (b)), we see that to obtain a good agreement we need to consider not only the Confirmed origins but also the Likely and the Dubious origins. This shows that in the context of our model, the number of p-oris required to reproduce the experimental I(t) curve in S. cerevisiae exceeds the number of Confirmed and Likely origins. Apart from the unexpected activity of Dubious origins, the requirement for a larger number of origins can be met by some level of random initiation (Czajkowsky et al., 2008) or initiation events away from mapped origins due to helicase mobility (Gros et al., 2015; Hyrien, 2016a). If fork progression can push helicases along chromosomes instead of simply passivating them, there will be initiation events just ahead of progressing forks. Such events are not detectable by the replication profiling experiments used to determine I(t) in Figure 2(b) and thus not accounted for by Imax. Given the uncertainty in replication fork velocity (a higher fork speed would require only Confirmed and Likely origins) and the possible experimental contribution of the p-oris in the rDNA part of chromosome 12 (not taken into account in our modeling), this conclusion needs to be confirmed in future experiments. It is to be noted that even if 829 p-oris are needed, on average only 352 origins have fired by the end of S-phase. For S. cerevisiae with well positioned p-oris, we have checked the robustness of our results with respect to a stochastic number of firing factors NDT from cell to cell (Poisson distribution, Iyer-Biswas et al. (2009)). We confirmed the I(t) bell shape with a robust duration of the S-phase of 58.6±4.3 min as compared to 58.5±3.3 min obtained previously with a constant number of firing factors. Interestingly, in an experiment where hydroxyurea (HU) was added to the yeast growth media, the sequence of activation of replication origins was shown to be conserved even though Tphase was lengthened from 1 hr to 16 hr (Alvino et al., 2007). HU slows down the DNA synthesis to a rate of ∼50 bp min−1 corresponding to a 30-fold decrease of the fork speed (Sogo et al., 2002). Up to a rescaling of time, the replication kinetics of our model is governed by the ratio between replication fork speed and the productive-interaction rate kon (neglecting here the possible contribution of the activation dynamics of firing factors). Hence, our model can capture the observation of Alvino et al. (2007) when considering a concomitant fork slowing down and kon reduction in response to HU, which is consistent with the molecular action of the replication checkpoint induced by HU (Zegerman and Diffley, 2010). In a model where the increase of I(t) results from the import of replication factors, the import rate would need to be reduced by the presence of HU in proportion with the lengthening of S-phase in order to maintain the pattern of origin activations. Extracting I(t) from experimental replication data for cells grown in absence (HU−) or presence (HU+) (Alvino et al., 2007), we estimated ImaxHU−∼6.0 Mb−1min−1 and ImaxHU+∼0.24 Mb−1min−1 for HU− and HU+ cells, respectively. The ratio ImaxHU−/ImaxHU+≃24.8∼vHU−/vHU+ is quite consistent with the prediction of the scaling law (Equation (5)) for a constant density of p-oris. We gathered from the literature experimental estimates of Imax, ρ0 and v for different eukaryotic organisms (Table 1). As shown in Figure 2 (c), when plotting Imax vs vρ02, all the experimental data points remarkably follow the diagonal trend indicating the validity of the scaling law (Eq. (5)) for all considered eukaryotes. We performed two series of simulations for fixed values of parameters ko, NDT and v and decreasing values of ρ0 with both periodic distribution (blue) and uniform (green) distributions of p-oris (Figure 2 (c)). The first set of parameters was chosen to cover high Imax values similar the one observed for Xenopus embryo (bullets, solid lines). When decreasing ρ0, the number of firing factors becomes too large and I(t) does no longer present a maximum. We thus decreased the value of NDT keeping all other parameters constant (boxes, dashed line) to explore smaller values of Imax in the range of those observed for human and D. melanogaster. We can observe that experimental data points’ deviation from Equation (5) is smaller than the deviation due to specific p-oris distributions. Experimental data for various eukaryotic organisms with genome length L (Mb), replication fork velocity v (kb/min), number of p-oris (Np−ori(t=0)), ρ0=Np−ori(t=0)/L (kb−1) and Imax (Mb−1min−1). All Imax data are from Goldar et al. (2009), except for S. cerevisiae grown in presence or absence of hydroxyurea (HU) which were computed from the replication profile of Alvino et al. (2007). For S. cerevisiae and S. pombe, Confirmed, Likely, and Dubious origins were taken into account. For D. melanogaster, Np−ori(t=0) was obtained from the same Kc cell type as the one used to estimate Imax. For Xenopus embryo, we assumed that a p-ori corresponds to a dimer of MCM2-7 hexamer so that Np−ori(t=0) was estimated as a half of the experimental density of MCM3 molecules reported for Xenopus sperm nuclei DNA in Xenopus egg extract (Mahbubani et al., 1997). For human, we averaged the number of origins experimentally identified in K562 (62971) and in MCF7 (94195) cell lines. S. cerevisiae in presence of HU 12.5 0.05 829 0.066 0.24 Alvino et al. (2007). Same Np−ori and ρ0 as S. cerevisiae in normal growth condition. Note that in human it was suggested that early and late replicating domains could be modeled by spatial inhomogeneity of the p-ori distribution along chromosomes, with a high density in early replicating domains (ρ0,early=2.6 ORC/100 kb) and a low density in late replicating domains (ρ0,late=0.2 ORC/100 kb) (Miotto et al., 2016). If low- and high-density regions each cover one half of the genome and ρ0,early≫ρ0,late, most p-oris are located in the high-density regions and the origin firing kinetics (Nfired(t,t+dt)) will mainly come from initiation in these regions. However, the length of unreplicated DNA also encompasses the late replicating domains resulting in a lowering of the global I(t) by at least a factor of 2 (Equation (1)). Hence, in the context of our model Imax≲0.5vρearly2. Interestingly, considering the experimental values for the human genome (Imax=0.3 Mb−1min−1 and v=1.46 kb min−1, Table 1), this leads to ρ0,early≳2.3 Ori/100 kb, in good agreement with the estimated density of 2.6 ORC/100 kb (Miotto et al., 2016). Inhomogeneities in origin density could create inhomogeneities in firing factor concentration that would further enhance the replication kinetics in high density regions, possibly corresponding to early replication foci. To summarize, we have shown that within the framework of 1D nucleation and growth models of DNA replication kinetics (Herrick et al., 2002; Jun and Bechhoefer, 2005), the sufficient conditions to obtain a universal bell shaped I(t) as observed in eukaryotes are a strong bimolecular reaction between localized p-oris and limiting origin firing factors that travel with replication forks and are released at termination. Under these conditions, the density of p-oris naturally decreases by the end of the S-phase and so does IS(t). Previous models in Xenopus embryo (Goldar et al., 2008; Gauthier and Bechhoefer, 2009) assumed that all sites contained a p-ori implying that the time tr to replicate DNA between two neighboring p-oris was close to zero. This clarifies why they needed some additional mechanisms to explain the final decrease of the firing rate. Moreover, our model predicts that the maximum value for I(t) is intimately related to the density of p-oris and the fork speed (Equation (5)), and we have shown that without free parameter, this relationship holds for five species with up to a 300-fold difference of Imax and vρ02 (Table 1, Figure 2 (c)). Our model assumes that all p-oris are governed by the same rule of initiation resulting from physicochemically realistic particulars of their interaction with limiting replication firing factors. Any spatial inhomogeneity in the firing rate I(x,t) along the genomic coordinate in our simulations thus reflects the inhomogeneity in the distribution of the potential origins in the genome. In yeast, replication kinetics along chromosomes were robustly reproduced in simulations where each replication origin fires following a stochastic law with parameters that change from origin to origin (Yang et al., 2010). Interestingly, this heterogeneity between origins is captured by the Multiple-Initiator Model where origin firing time distribution is modeled by the number of MCM2-7 complexes bound at the origin (Yang et al., 2010; Das et al., 2015). In human, early and late replicating domains could be modeled by the spatial heterogeneity of the origin recognition complex (ORC) distribution (Miotto et al., 2016). In these models, MCM2-7 and ORC have the same status as our p-oris, they are potential origins with identical firing properties. Our results show that the universal bell-shaped temporal rate of replication origin firing can be explained irrespective of species-specific spatial heterogeneity in origin strength. Note, however, that current successful modeling of the chromosome organization of DNA replication timing relies on heterogeneities in origins’ strength and spatial distributions (Bechhoefer and Rhind, 2012). To confirm the simple physical basis of our modeling, we used molecular dynamics rules as previously developed for S. cerevisiae (Arbona et al., 2017) to simulate S-phase dynamics of chromosomes confined in a spherical nucleus. We added firing factors that are free to diffuse in the covolume left by the chain and that can bind to proximal p-oris to initiate replication, move along the chromosomes with the replication forks and be released when two fork merges. As shown in Figure 2 (a,b) for Xenopus embryo and S. cerevisiae, results confirmed the physical relevance of our minimal modeling and the validity of its predictions when the 3D diffusion of the firing factors is explicitly taken into account. Modeling of replication timing profiles in human was recently successfully achieved in a model with both inhibition of origin firing 55 kb around active forks, and an enhanced firing rate further away up to a few 100 kb (Löb et al., 2016) as well as in models that do not consider any inhibition nor enhanced firing rate due to fork progression (Gindin et al., 2014; Miotto et al., 2016). These works illustrate that untangling spatio-temporal correlations in replication kinetics is challenging. 3D modeling opens new perspectives for understanding the contribution of firing factor transport to the correlations between firing events along chromosomes. For example in S. cerevisiae (Knott et al., 2012) and in S. pombe (Kaykov and Nurse, 2015), a higher firing rate has been reported near origins that have just fired (but see Yang et al. (2010)). In mammals, megabase chromosomal regions of synchronous firing were first observed a long time ago (Huberman and Riggs, 1968; Hyrien, 2016b) and the projection of the replication program on 3D models of chromosome architecture was shown to reproduce the observed S-phase dynamics of replication foci (Löb et al., 2016). Recently, profiling of replication fork directionality obtained by Okazaki fragment sequencing have suggested that early firing origins located at the border of Topologically Associating Domains (TADs) trigger a cascade of secondary initiation events propagating through the TAD (Petryk et al., 2016). Early and late replicating domains were associated with nuclear compartments of open and closed chromatin (Ryba et al., 2010; Boulos et al., 2015; Goldar et al., 2016; Hyrien, 2016b). In human, replication timing U-domains (0.1–3 Mb) were shown to correlate with chromosome structural domains (Baker et al., 2012; Moindrot et al., 2012; Pope et al., 2014) and chromatin loops (Boulos et al., 2013, Boulos et al., 2014). Understanding to which extent spatio-temporal correlations of the replication program can be explained by the diffusion of firing factors in the tertiary chromatin structure specific to each eukaryotic organism is a challenging issue for future work. For the uniform distribution scenario, Lρ0 origins are randomly positions in the segment [0,L], where ρ0 is the average density of potential origins and L the total length of DNA. For the periodic distribution scenario, exactly one origin is positioned in every non-overlapping 1/ρ0 long segment. Within each segment, the position of the origin is chosen randomly in order to avoid spurious synchronization effects. A random number is generated, and if it is inferior to this probability, an unreplicated p-ori is chosen at random, two diverging forks are created at this locus and the number of free firing factors decreases by 1. Finally, every fork is propagated by a length vdt resulting in an increase amount of DNA marked as replicated and possibly to the passivation of some p-oris. If two forks meet they are removed and the number of free firing factors increases by 1. Forks that reach the end of a chromosome are discarded. The numbers of firing events (Nfired(t)), origin passivations, free firing factors (NFD(t)) and unreplicated p-oris (Np−ori(t)) as well as the length of unreplicated DNA (LunrepDNA(t)) are recorded allowing the computation of IS(t) (Eq. (1)), the normalized density of p-oris (ρp−ori(t))/ρ0), the normalized number of free firing factors (NFD(t)/NFD∗(t)) and the ratio between the number of origin passivations and activations. Simulation ends when all DNA has been replicated, which define the replication time. Replication kinetics simulation for the 3D model follows the same steps as in the well-mixed model except that the probability that a free firing factor activates an unreplicated p-ori depends on their distance d obtained from a molecular dynamic simulation performed in parallel to the replication kinetics simulation. We used HOOMD-blue (Anderson et al., 2008) with parameters similar to the ones previously considered in Arbona et al. (2017) to simulate chromosome conformation dynamics and free firing factor diffusion within a spherical nucleus of volume VN. The details of the interaction between the diffusing firing factors and the p-oris is illustrated in Figure 2—figure supplement 1. Given a capture radius rc set to two coarse grained chromatin monomer radiuses, when a free firing factor is within the capture volume Vc=43πrc3 around an unreplicated p-ori (d<rc), it can activate the origin with a probability p. In order to have a similar firing activity as in the well-mixed model, rc and p were chosen so that pVc/VN takes a value comparable to the kon values used in the well-mixed simulations. For each set of parameters of the well-mixed and 3D models, we reported the mean curves obtained over a number of independent simulations large enough so that the noisy fluctuations of the mean IS(t) are small compared to the average bell-shaped curve. The complete set of parameters for each simulation series is provided in Supplementary file 1. The scripts used to extract yeast I(t) from the experimental data of Alvino et al. (2007) can be found here https://github.com/ jeammimi/ifromprof/blob/master/notebooks/exploratory/Alvino_WT.ipynb (yeast in normal growth conditions) and here https://github.com/jeammimi/ifromprof/blob/master/notebooks/exploratory/Alvino_H.ipynb (yeast grown grown in Hydroxyurea) (Arbona and Goldar, 2018). A copy is archived at https://github.com/elifesciences-publications/ifromprof. Journal of Computational Physics 227:5342–5359. New Journal of Physics 16:115014. Molecular Biology of the Cell 18:3059–3067. Journal of Molecular Biology 375:12–19. Journal of Molecular Biology 320:741–750. Journal of Molecular Biology 32:327–341. Journal of Molecular Biology 425:4673–4689. In: D. L Kaplan, editors. The Initiation of DNA Replication in Eukaryotes. Switzerland: Springer International Publishing. pp. 65–85. The Journal of Cell Biology 136:125–135. Thank you for submitting your article "The eukaryotic bell-shaped temporal rate of DNA replication origin firing emanates from a balance between origin activation and passivation" for consideration by eLife. Your article has been reviewed by three peer reviewers, and the evaluation has been overseen by a Reviewing Editor and Kevin Struhl as the Senior Editor. The reviewers have opted to remain anonymous. Based on the three positive reviews, it is possible that this model can by published in eLife, but there are some issues that two of the reviewers raise that require a response. Once a response is received, the paper will be re-considered. This appealing paper advances a new hypothesis to explain the observed, apparently quite general phenomenon in eukaryotic replication that the initiation rate of origin firing (relative to the amount of unreplicated DNA) decreases at the end of S-phase after having increased substantially throughout the first part of S-phase. There is agreement on the mechanism of the increase, but three different groups (one of which includes two of the present authors) have advanced three different hypotheses (subdiffusive motion, a dependence on replication fork density of firing factor affinity for p-oris, or inhomogeneous firing probabilities). The present paper proposes a fourth, that the limiting factor is the finite average spacing between potential origins (p-oris) and makes a case that this new hypothesis is both simple and natural. The evidence presented is a mix of heuristic argument, simulation, and a limited comparison of experimental data. The major experimental test is of a simple relation derived by the authors, Imax ~ v ρ02, where Imax is the maximum initiation rate, v the fork velocity, and ρ0 the density of potential origins at the start of S-phase. The authors further look at a 3d simulation of the diffusion process in a simple model where all origins are treated on an equal footing and find a qualitative agreement in the I(t) curves. The paper thus gives a simple model that advances our understanding of the replication process, adding a reasonable dynamical model to explain kinetics, and providing at least some experimental support-probably not enough to be completely convincing on its own but enough to make others take the hypothesis seriously and inspire further experimental tests. It is thus a nice advance. Having said all of this, there are questions / reservations about some of the details as outlined below. 1) In the figures given for Xenopus laevis in Table 1, the value of ρ0is given as 0.333/kb, with Loveland et al. the reference. In that reference, though, Figure 3D shows only that the minimum average distance between fired origins decreases to 3kb. This implies only a lower bound on ρ0, since there may be passive replication in those experiments. 2) The 3D simulations, if they are understood correctly, will fail to reproduce the known genome-position dependence of firing times. Put another way, the authors argue in the Discussion section (second paragraph) that their modeling implies that all p-oris are the same. But in the S. cerevisiae data (and for other organisms), there are known dependences of median firing time on genome position. It may be that the model set forth here does a good job explaining the I(t) dependence but not the full I(x,t) dependence, where x is the genome position. 3) In a related point, the authors speculate that enhanced firing rates could result from diffusion of factors released. However, there is also evidence that chromatin looping can inhibit the firing of neighboring origins. Both effects could be present, suggesting that untangling spatiotemporal correlations might be subtle. 4) When the authors modeled replication in the presence of HU, it appears that the only change made in the parameters from unperturbed replication was the speed of replication forks. Is this correct? If so, it is surprising, as activation of late-firing origins are suppressed or delayed in HU, and according to Figure 1a, one might expect less origins to be passivated with slower replication forks in HU. The authors need to comment on this. 5) Figure 2B: It was unexpected that dubious origins needed to be included for better modeling. The authors need to discuss potential reasons for this. 6) It has been proposed that DNA replication takes place at replication foci in vivo, where replication factors are highly concentrated. Based on the authors' model that the localization of origins and recycling of replication factors can explain most of DNA replication kinetics, the authors need to discuss how the presence of replication foci would affect origin usage and replication kinetics. 7) The paper does not cite a published model for DNA replication timing by Miotto et al., 2016 that essentially states that there are more ORC sites than are utilized during S phase and early replicating regions at the beginning of S phase is favored simply because there are far more ORC sites, whereas firing from relatively few ORC sites in late replication regions is due to increased time and the unavailability of ORC sites previously replicated. This paper should be cited and discussed to compare it to the proposed model. We used as a proxy for the number of potential origins in Xenopus embryo the highest density (0.333 kb−1, Loveland et al., (2012)) of activated replication origins reported by the experimental studies of Loveland et al., (2012) and Herrick et al., (2002). We agree that this approach only provides a lower bound on ρ0 and we mentioned it in Table 1: “For Xenopus embryo, we used the experimental density of activated origins to estimate Np-ori(t = 0) which is probably lower than the true number of p-oris.” We had overlooked the work of Mahbubani et al., (1997) that estimated that, on average, one MCM3 molecule was bound to every 1.5 kbp of DNA from demembranated Xenopus sperm nuclei DNA in Xenopus egg extract. Assuming that a potential origin corresponds to a dimer of MCM2-7 hexamers, this experimental quantification provides an estimate of one p-ori every 3 kbp i.e. ρ0 = 0.333 kb−1. Note that in the work of Loveland et al., (2012), licensing of λ-phage DNA was performed in condition of incomplete chromatinization and replication initiation was obtained using a nucleoplasmic extract system with strong initiation activity, which may explain the high density of activated origins observed in this work. The 1D simulations as well as the 3D simulations indeed do not consider any heterogeneity between potential origins properties. Hence, neglecting origin passivation, the median firing times for all the origins are identical. Any inhomogeneity in I(x,t) in our simulations thus reflects the inhomogeneity in the distribution of the potential origins in the genome, and not the heterogeneity of origin strengths. We are sorry if our presentation suggested that all yeast origins behave the same. 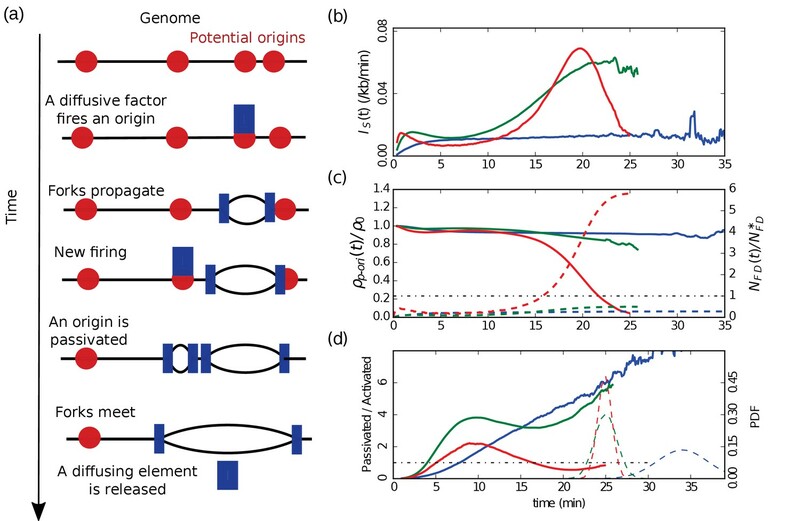 In yeast, replication kinetics along chromosomes were robustly reproduced in simulations where each replication origin fires following a stochastic law with parameters that change from origin to origin (Yang et al., 2010). Interestingly, this heterogeneity between origins is captured by the Multiple-Initiator Model (MIM) where origin firing time distribution is modeled by the number of MCM2-7 complexes bound at the origin (Yang et al., 2010). In human, early and late replicating domains could be modeled by the spatial heterogeneity of the origin recognition complex (ORC) distribution (Miotto et al., 2016; see answer to point 7). In these models, MCM2-7 and ORC have the same status as our p-oris, they are potential origins with identical firing properties. Our results show that the universal bell-shaped temporal rate of replication origin firing can be explained irrespective of species-specific spatial heterogeneity in origin strength. In a recent successful modelisation of DNA replication in human, Löb et al., (2016) took into consideration both an inhibition of origin firing 55 kb around an active fork, and an enhanced firing rate further away up to a few 100 kb. However, Gindin et al., (2014) succeeded in reproducing MRT experimental profiles without introducing inhibition nor enhanced firing rate due to fork progression. These two modeling works illustrate that indeed untangling spatio-temporal correlations in replication kinetics is challenging. In that respect, 3D modeling explicitly taking into account the transport of firing factors will allow us to quantify the contribution of physicochemistry to replication spatio-temporal correlations and in turn underline the requirement for specific biological mechanisms. We did not explicitly performed simulations to model replication in the presence of hydroxyurea (HU), but we simply showed that the scaling law Imax ~ v ρ02 (Eq. (5)) did apply when extracting Imax and the replication fork speed v from data obtained in this experimental condition, keeping the same density ρ0 of p-ori as in normal growth condition (Confirmed, Likely and Dubious origins are taken into account). In our model, during the second part of S-phase when most firing factors are free, the dynamics of activation of p-oris is controlled by the productive-interaction rate kon between a free firing factor and a p-ori so that a reduced replication speed will indeed result in firing of most late p-oris and thus a very low frequency of origin passivation. However, Alvino et al. (2007) showed that the pattern of origin firing was the same with and without HU, up to some slowing down of the progression through S-phase with HU. Up to a rescaling of time, the replication kinetics of our model is governed by the ratio between replication fork speed and kon (neglecting here the possible contribution of the activation dynamics of firing factors). Hence, our model can capture the observation of Alvino et al., (2007) considering that HU (i) induces fork slowing down and (ii) triggers a checkpoint reducing the activity of all p-oris, which can be modeled by a kon decrease commensurate with fork speed reduction. We agree that dubious origins are not expected to fire as frequently as Confirmed and Likely origins. A number of scenarios can contribute to the requirement for a larger number of potential origins than the number of Confirmed and Likely origins. (1) There might be some level of random initiation. (2) The maximum Imaxscales linearly with the fork speed. In the model we used a value of 1.5 kb/min close to the one reported in the literature (Sekedat et al., 2010; 1.6 kb/min). However, if the value of the fork speed was ∼ 2 kb/min, only Confirmed and Likely origins would be necessary to obtain the required Imaxvalue. (3) We did not consider the potential effect of the 150 p-ori present in the rDNA part of chromosome 12. (4). The modeling in this work is performed under the assumption of a well-mixed system. It thus does not address the effect of the presence of replication foci. Replication foci would locally enhance the concentration in firing factors once released from the merging of two forks. This would increase locally the kinetics in the replication foci but decrease it elsewhere. Hence, these foci are not expected to have a strong effect on the global I(t). However, they are likely to induce spatial correlations in the replication program. Projection of the DNA replication program on 3D models of chromosome architecture allowed reproduction of the dynamic of replication foci in human (Löb et al., 2016). We thus expect that future work combining our model of replication kinetics with explicit modeling of firing factor 3D transport in the nucleus will allow us to address directly the nature and the consequence of replication foci on the kinetics of the replication program. We thank the reviewers for pointing this interesting article. This work reports an inhomogeneity of ORC distribution along human chromosomes, with a dense distribution of potential origins in early replicating regions (ρ0,early = 2.6 ORC /100 kb) and a very sparse density in late replicating regions (ρ0,late = 0.2 ORC /100 kb). Importantly, a model taking into account the experimental inhomogeneous distribution of ORC could account for mean replication timing profiles. The model developed in Miotto et al., (2016) does not include a limiting firing factor that controls the firing rate, instead it assumes a constant firing rate for all p-oris, as well as a background of random initiation. It remains unclear whether it produces a bell-shaped I(t) curve. In our model, if we consider a biphasic distribution of p-oris, with half of the genome having a high density ρ0,early and the other half a low density ρ0,lateof p-oris with ρ0,earl >> ρ0,late, most p-oris are located in the high density regions assuring their early replication and the origin firing kinetics (Nfired(t,t+dt)) will mainly come from initiation in these regions. However, in this model, the length of unreplicated DNA also encompasses the late replicating domains resulting in a lowering of the global I(t) by at least a factor of 2 (Eq. (1)). Hence, in the context of our model Imax. 0.5vρ2early. Interestingly, considering the experimental values for the human genome (Imax= 0.3/Mb/min and v = 1.46kb/min, Table 1), it leads to ρ0,early & 2.3 Ori/100 kb, in good agreement with the estimated density of 2.6 ORC/100 kb reported in this work. We thank F. Argoul for helpful discussions. This work was supported by Institut National du Cancer (PLBIO16-302), Fondation pour la Recherche Médicale (DEI20151234404) and Agence Nationale de la Recherche (ANR-15-CE12-0011-01). BA acknowledges support from Science and Technology Commission of Shanghai Municipality (15520711500) and Joint Research Institute for Science and Society (JoRISS). We gratefully acknowledge support from the PSMN (Pôle Scientifique de Modélisation Numérique) of the ENS de Lyon for the computing resources. We thank BioSyL Federation and Ecofect LabEx (ANR-11-LABX-0048) for inspiring scientific events. © 2018, Arbona et al.